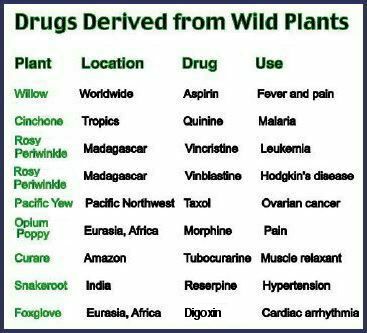 Nearly half of all human pharmaceuticals now in use were originally derived from natural sources. Natural products range from aspirin (originally obtained from the willow tree) to taxol, the anti-cancer drug discovered in the Pacific yew tree. About half of all anti-cancer drugs introduced since the 1940s are either natural products or medicines derived directly from natural products, the study notes. Five of the world’s top 30 drugs are derived from fungi – Penicillin being the most noteworthy. Fungi are the least studied and most promising groups of therapeutic organisms. Merck’s blockbuster drug Lovastatin comes from a soil fungus and it’s used to lower cholesterol. The Swiss pharmaceutical Sandoz discovered the immunosuppressant cyclosporin from the insect-killing Cordyceps fungus and changed human-organ transplant surgery. Thousands of species of fungi are known and likely another million are awaiting discovery. Today many other compounds taken from Nature’s medicine cabinet are showing promise (see sidebar). Natural products useful in preventing or treating disease have been highly sought after throughout human history. A major problem in characterizing many natural products is that they represent a complex mixture of ingredients, each one of which may contribute to bioactivity.-1,3;1,6-glucans from fungi (e.g., mushrooms) and yeast are well-known biologic response modiﬁers that function as immunostimulants against infectious diseases and cancer (1, 2). Unlike most other natural products, puriﬁed -1,3-glucans retain their bioactivity. This has permitted the characterization of how -1,3-glucans work on a cellular and molecular level (The Journal of Immunology).